Originally founded as the Ro-Pat-In Corporation by Adolph Rickenbacher and George Beauchamp in 1931, Rickenbacker were the creators of the first ever solid-bodied electric guitars, known as the 'frying pan' (due to their long necks and circular bodies.) From there they went on to create the Electro-Spanish Model B and the Electro-Spanish Ken Roberts which both saw limited releases in the States. 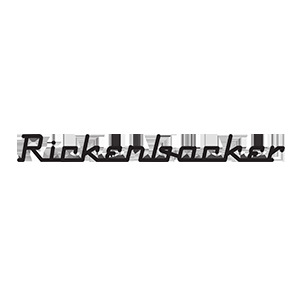 Rickenbacker continued to produce steel guitars all the way up until the Rock and Roll boom of the 50's, at which point they moved onto the more traditional acoustic and electric guitars. It wasn't however until John Lennon started using a Rickenbacker in the 60's that they really started to take off though. Lennon utilised the 325 during The Beatles infamous performance on the Ed O'Sullivan Show. We have a fantastic selection of Rickenbacker Electric Guitar's and Bass Guitar's available to order. The Classic Rickenbacker bass - famous for its ringing sustain, treble punch and solid underlying bass. The Rickenbacker 4003S is based on the classic 4001S models from '64, popularised by players like Paul McCartney and Chris Squire. The Model 660 and 660/12 feature a charactered Maple cutaway body based on an innovative design from the 1950's. Deluxe hollowbody electric guitar with special contour around the body and single coil pickups with 3-way selectors. The Rickenbacker Model 660 is based around one of Rickenbacker's most innovative designs from the '50s.